The Silk Pavilion explores the relationship between digital and biological fabrication on product and architectural scales.The primary structure was created of 26 polygonal panels made of silk threads laid down by a CNC (Computer-Numerically Controlled) machine. 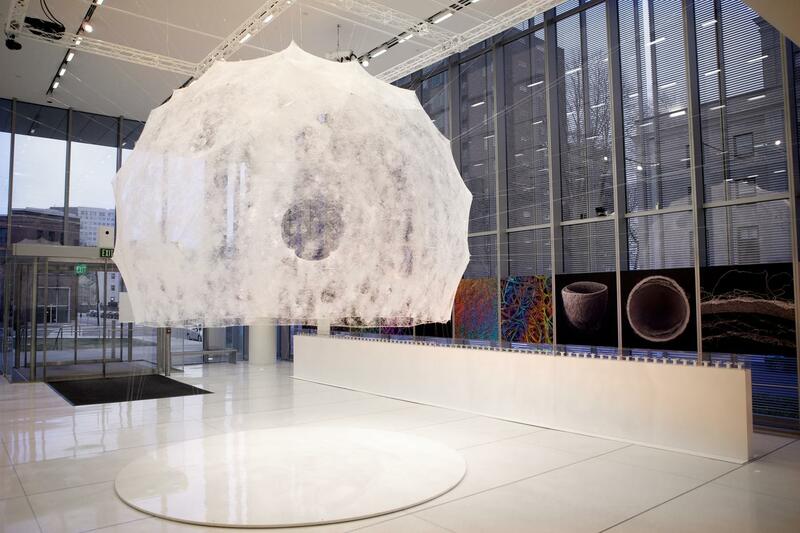 Inspired by the silkworm’s ability to generate a 3D cocoon out of a single multi-property silk thread (1km in length), the overall geometry of the pavilion was created using an algorithm that assigns a single continuous thread across patches providing various degrees of density. Overall density variation was informed by the silkworm itself deployed as a biological printer in the creation of a secondary structure. 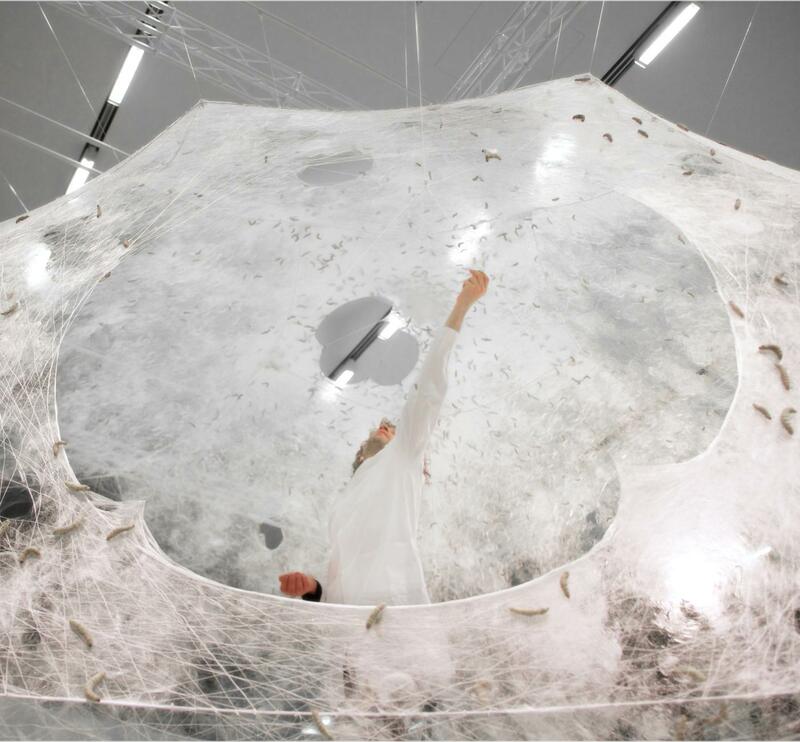 A swarm of 6,500 silkworms was positioned at the bottom rim of the scaffold spinning flat non-woven silk patches as they locally reinforced the gaps across CNC-deposited silk fibers. Following their pupation stage, the silkworms were removed. 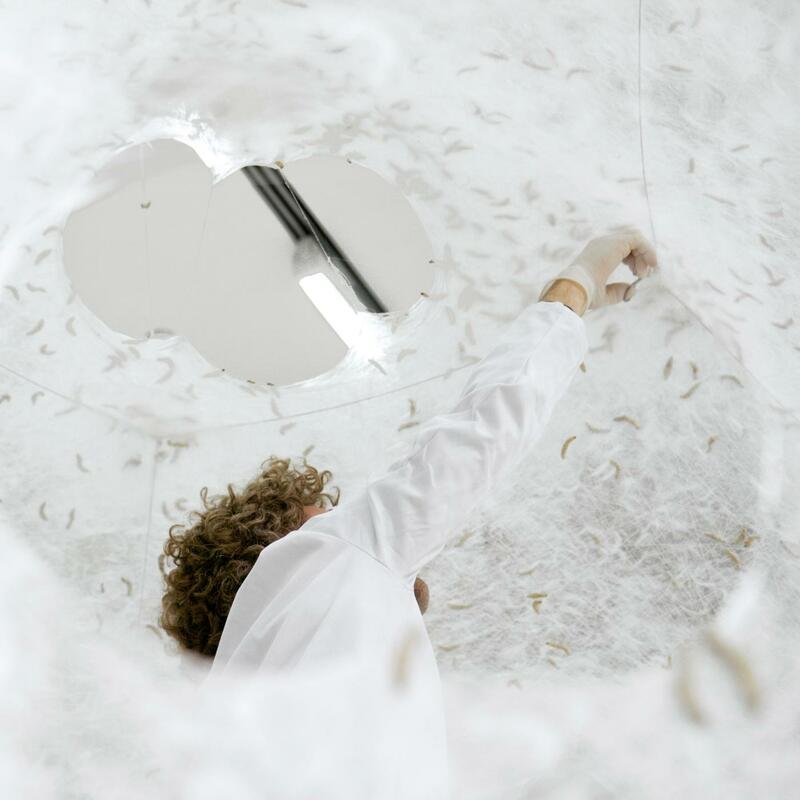 Resulting moths can produce 1.5 million eggs with the potential of constructing up to 250 additional pavilions. Affected by spatial and environmental conditions, including geometrical density as well as variation in natural light and heat, the silkworms were found to migrate to darker and denser areas. Desired light effects informed variations in material organization across the surface area of the structure. A season-specific sun path diagram mapping solar trajectories in space dictated the location, size, and density of apertures within the structure in order to lock in rays of natural light entering the pavilion from south and east elevations. The central oculus is located against the east elevation and may be used as a sun clock. 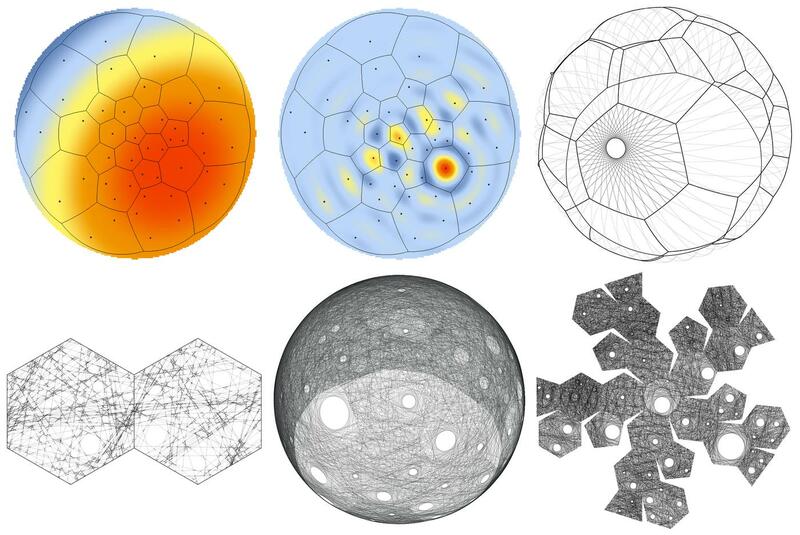 Research and design by the Mediated Matter research group at the MIT Media Lab in collaboration with Prof. Fiorenzo Omenetto (TUFTS University) and Dr. James Weaver (WYSS Institute, Harvard University). All Mediated Matter images are subject to copyright. Please contact the group for more information or about reuse: mm-images@media.mit.edu.